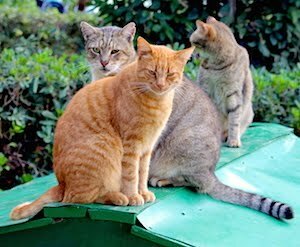 Malta, in November 2016: One of the foremost task on receiving the newly published hardcover version of our book 'Islands of Cats' was to present each of the featured, steadfast, stray cat carers with a copy. The smile that Antonella beamed as we handed her the book, told us more than words how much she appreciated our work. As she browsed through the pages, Antonella told us that there was still a dire situation with stray cats, and how she hoped our book would help to bring more attention to the matter. Antonella made us feel, that the work we had invested in the book had not been in vain. Thank you for your devotion to the needy animals in Malta. You can read about Antonella's amazing work and her network of volunteers in 'Islands of Cats' on pages 68-69. The book tells the story of a representative 22 of over 1,000 stray cat carers in Malta and Gozo on 128 pages, illustrated by over 250 colourful photographs - accompanied by cat facts, stories, interviews, and it introduces places of interest on the Islands. 'Islands of Cats' is available in English, Maltese and German, as well as E-Books including Kindle. And most of all, we donate part of the proceeds of each book sold in aid of neutering and spaying of stray and abandoned cats in the Maltese Islands. Click here to order your copy, and please tell your friends.